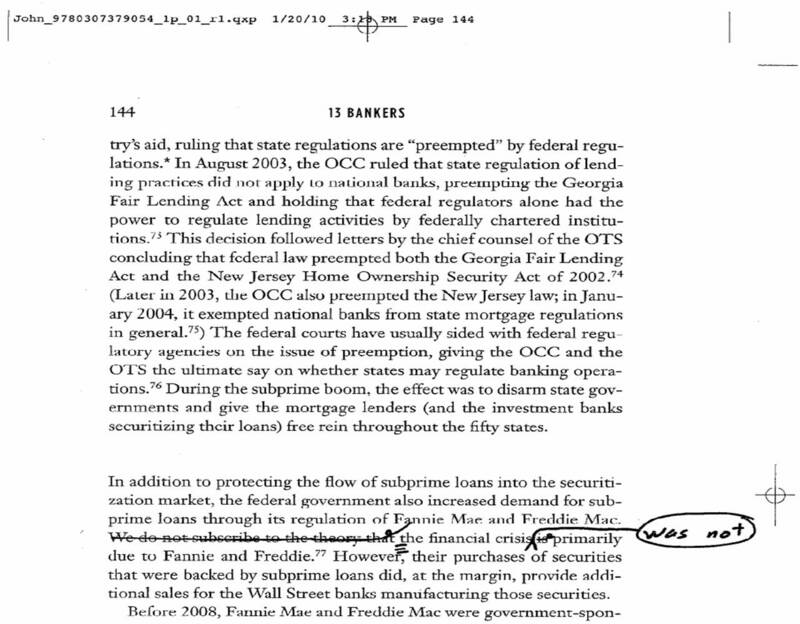 On page 144, we write, “The financial crisis was not primarily due to Fannie and Freddie.” That sentence is followed by a footnote (77) that refers to an article by Charles Calomiris and Peter Wallison that, in fact, argues that the crisis was due to Fannie and Freddie. (The article title, which we give in the footnote, is “Blame Fannie Mae and Congress for the Credit Mess.”) This is obviously a mistake on our part. This is what happened. In the final proofs that we were able to review, that sentence used to read: “We do not subscribe to the theory that the financial crisis is primarily due to Fannie and Freddie,” with the same footnote at the end. In that context, it’s clear that we are citing the Calomiris and Wallison article as an example of that theory.